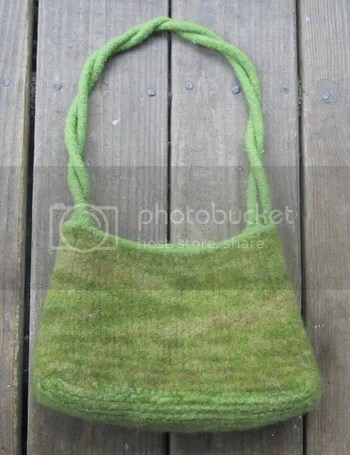 Did I mention before that I knit this bag from the top down?? I actually knit the straps first, using a provisional cast on, and incoporated them into the casting on of the top of the bag. If that makes any sense. 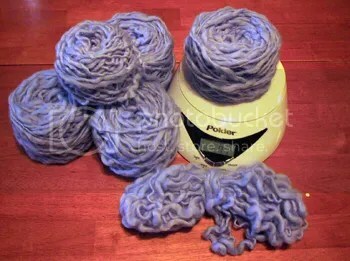 Then I just kept knitting until I had what appeared to be enough yarn left for the decreases. (All that to avoid starting out on DPNs.) I really liked doing it that way and I’d do it again. Soooo….I felted my monster hat, then lopped off the bottom of the wee bag and sewed the new, longer bag body to the bottom of it. Then I felted the whole thing one more time. The stitches where I joined the two are still somewhat visible, so I think I’m going to try to clean it up with a little needle felting. If that doesn’t do the trick, I’ll embellish it with a little bit of trim or some felted leafy-viney-Nicky-Epstein inspired decorative mumbo-jumbo..
You know, that Malabrigo I just posted about? 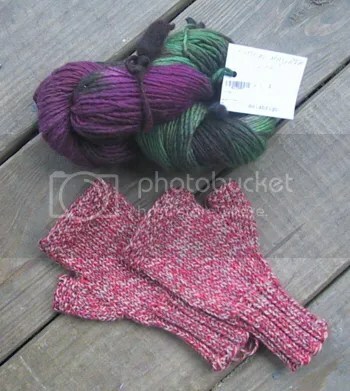 My Mother’s Day Malabrigo? Ahhhh, the colorway. When I was winding it, I fell in love all over again. It really is so stunning — I can’t put it into words. Holy crap. I took pictures, but they don’t do it justice. Gah. Love. Anyhooo…I thought that surely, until the day comes when I can actually purchase the pattern, I could probably wing it. Andrea swears that her li’l Lucy (whch totally kicks, it’s the coooolest little bag) only required one skein of Malabrigo, so I think I can pull it off. 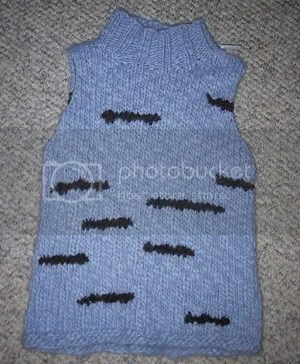 The knitting is pure joy. Seriously, the monotony is offset by the absolute gorgeousness of the yarn, and I considered never knitting with anything else, ever again. When I finished (less than 24 hours, go me) I admit I did have some doubts — like perhaps the bag might be very very short — but I threw caution to the wind and chucked it in the washer anyway. While it was felting, I rummaged around and found a photo of Andrea’s pre-felted Lucy. So the question remains: what should I do? 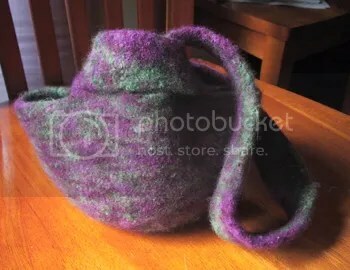 Cut it up and make a felted something-else? 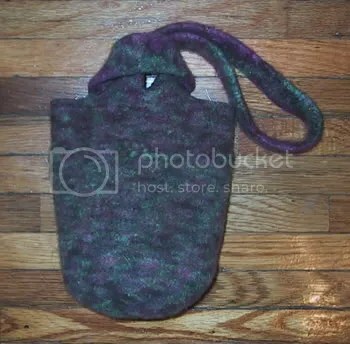 Or get another skein (they do have one, I called) and cut off the existing bag before the decreases, knit a new bottom that’s much longer, felt it, then sew the two together? 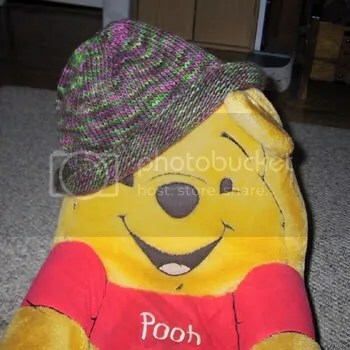 Cut off the straps and wear it as a beanie? Anyone? 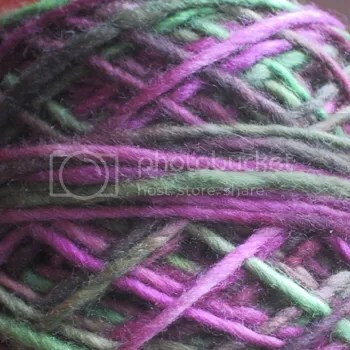 I neglected to post about my rockin’ DH and how he again took my girls to the yarn store to pick out yarn for me, this time for Mother’s Day. Love that man! And this time I super duper scored…. Yup, I’m raising them right…my 5yo went right for the Malabrigo. 🙂 The fingerless gloves are knitted with my 2yo’s selection, Karabella Aurora Melange, which is super scrunchy. Knit in Cascade Fixation (less than one ball!) on US3 needles. Pattern mods: Same as the first pair. FWIW, I do think the directions for the newborn size have an error. But I worked it out. Love this pattern!! Knit in KnitPicks WotA and Merino Style on US13 needles. 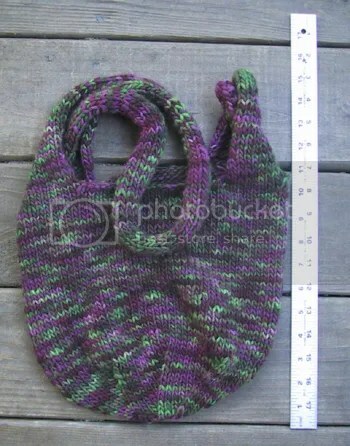 Pattern mods: I double stranded Merino Style for the base of the bag, until I ran out. So I don’t think I did all 34 rows or whatever the pattern calls for. Just picked up stitches around the base and started knitting up, doing the decreases as called for every 10 rows. I ran out of WotA around row 48, so I just did an i-cord bind off with MS (saved by a knitting friend with extra Asparagus on hand!). I knit the i-cord handles separately and stitched them on before felting. Pattern mods: Used a figure-8 cast-on instead of the recommended provisional because I’m still not feeling the short-row love. 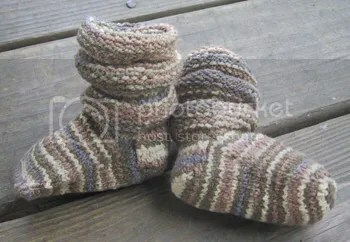 I think there might possibly be a pattern error in the short row heel instructions (either that or I’m really, really dumb, which I’m not ruling out either), so I’m going to double-check that with waste yarn before I knit the second pair. This is a really fun pattern, save for all the purling at the end, which can be remedied by using the method in this pattern. You get $20 free for signing up. I really haven’t found any catches…I just did it and had my $20 within the hour. A cool service, too, I think I’ll use it again! I’ve looked at sniping services before, but never wanted to pay anything…but this one is totally free. Right up my bargain-loving alley. I sure have been adding to my bag of coffee tricks this month! Next up: the french press coffee maker that has been sitting in my cabinet, unopened, for several years. I don’t know why — I was elated to receive it — but I’ve just never used it. Until now! I reached the end of the Boot Up Blend I’d finely ground, and decided to coarsely grind some New Media Mavericks for the french press. The process of making it was simple (albeit a touch more time consuming than the moka pot) and yielded a great, very light cup of coffee. 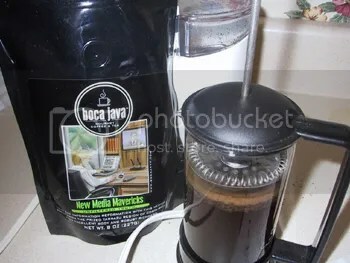 Whereas the others I’ve sampled so far were one-cup-at-a-time coffees (um, admittedly this might have something to do with the concoctions I’ve been making), this one struck me as the kind of coffee I’d make if I planned to down the whole pot while pulling an all-nighter. Good stuff. 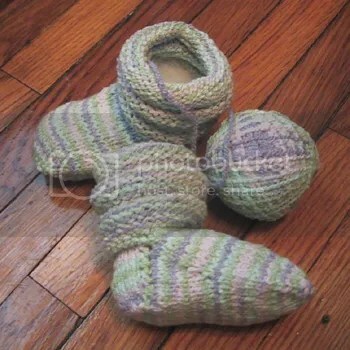 but I’ll also use the yarn to make something much more attractive. That won’t be hard. The next coffee on my list to try — Boot Up Blend, because honestly, while I like flavored coffee a lot, I found that I got tired of the same one day after day. I wanted to go with straight-up coffee this time around (or at least start out with straight-up coffee. 😉 ). I abandoned my crappy drip maker in favor of the most excellent moka pot I picked up at Ikea. This thing makes a great, quick cup of espresso, which I used to make a ghetto caramel macchiato, from online instructions: homemade vanilla syrup in the bottom of the mug, followed by warmed, sort of frothy milk. 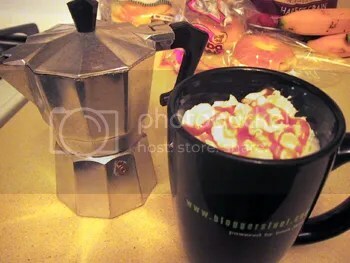 Then you pour the espresso through the milk, top with whipped cream and caramel syrup. I admit that when the brewing was done, it smelled really strong to me and I wasn’t sure if I’d like it. But maaaan, it’s freaking perfect. Two thumbs up. Off to make more vanilla syrup now.